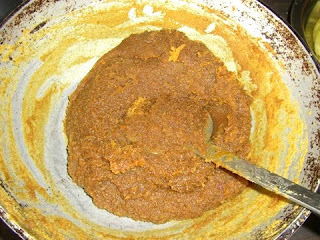 Here is an Authentic Recipe for Kalle Bela Thenginkai Obbattu ( Obbattu or Holige pronounced 'Ho' as in Home 'Li' as in Lip and 'Ge' as in Get), a traditional sweet of the South. This is easy to make and the more number of times you try this recipe, the faster you finish the procedure. This delightful recipe is my Mom's. Photos by my sister B. The procedure is illustrated step by step with pictures because 'a picture is thousand words'. Sometimes, its easy to explain when there's a picture. Take 2 Cups Maida flour. Add 8 table spoons Oil and 1/2 teaspoon Turmeric Powder. 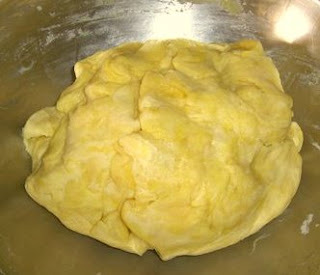 Mix into a dough using little water. Keep it aside. 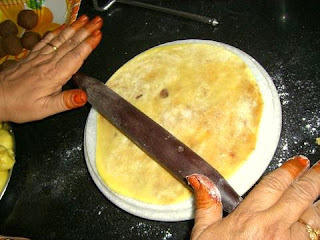 It is optional to soak the dough in oil. 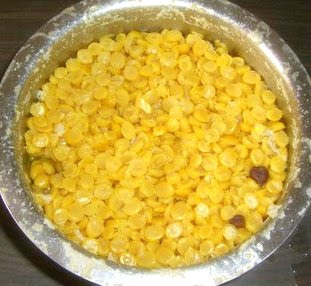 1 Cup Channa Dal (Kadala Paruppu). 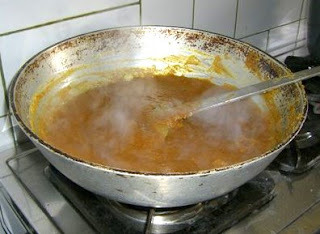 Cook in Pressure Cooker. Grated / Powdered Jaggery 2 and 1/2 Cups. 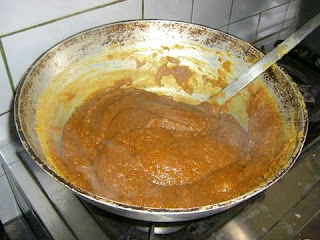 Grind the Cooked Dal, Coconut and Jaggery with Cardamom powder (from 8 to 10 pods) and Nutmeg Powder (1 tsp). Do not add water. Becomes Semi-Solid. At this stage add little Ghee. This will enhance the taste and flavor. (stage 2). Hoorna is done. 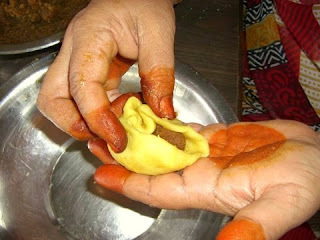 At this stage, when you try to make balls, Hoorna should not stick to the hand(stage 3). Make balls with the cooled Hoorna. Make balls out of the Maida Dough. This should be a little smaller than the Hoorna Balls. Flatten the Maida Ball to a one and a half to two inchs in diameter. 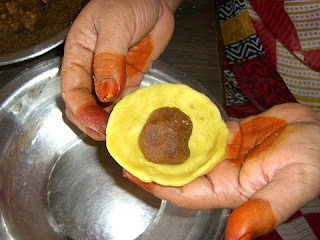 Place the Hoorna Ball in the Middle of the flat Maida dough. 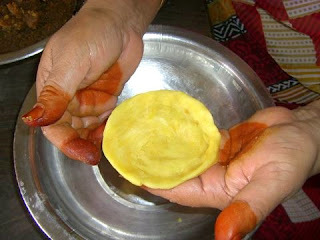 Close and Seal the Hoorna inside or, invert and close the hoorna from the top very carefully. Ready the Suffed Maida Balls before rolling them. Dredge in the flour and Roll the Stuffed Maida ball. Roll the stuffed Maida Ball. 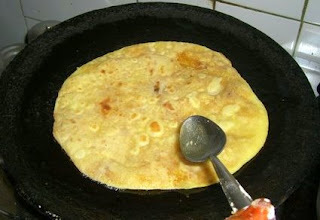 Toss it in a hot Tawa and Apply Ghee on both sides. The tasty authentic obbattu is ready. 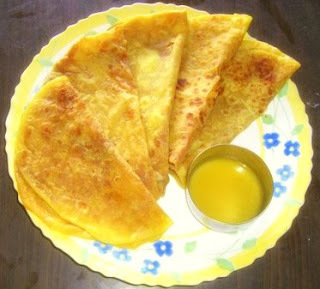 Serve with Ghee or Milk. OMG!!! Bayalli neer barta ide kanamma!! !What a beautiful color of turmeric and Hoorna. One more surprise awaits you very soon. color of the holige looks so good! 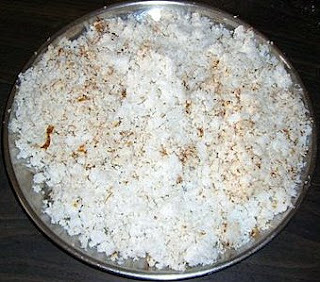 Tamil Nadu we call this dish as Poli. Thanks for the step by step procedure. SUPER MYTHREYEE. THANKS FOR A STEP BY STEP GUIDE TO HOLIGE. 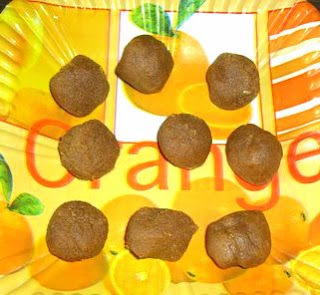 I AM GOING TO TRY THIS SOON( FOR AKSHAYA THRITHIYAI) ON APRIL 20, 2007.
poli comes out nicely.my sugestion is that we can add kesari powder inlieu of turmeric powder so that the colour and smell will be more comfortable. Asha: Thanks a lot. Happy you liked it. 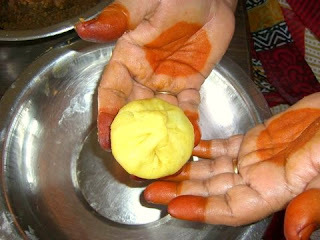 Sister B: thanks for taking such good pictures while amma was preparing this delicacy. 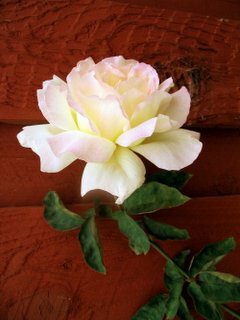 Roopa: Thanks a bunch and thanks for dropping by. 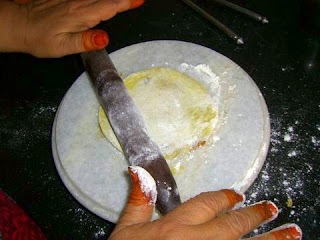 Menu Today: Yes, Its called poli. Thanks. Anonymous: Sure, give it a shot. 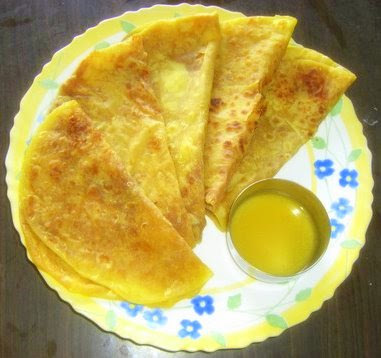 If you are a little conscious about having maida, substitute with wheat flour. You sure will like that too. Ayesha: Thanks and thanks for dropping by. Anu Aunty: I am happy that you liked this blog. Will surely try with Kesari Powder next time I do this. Thanks for the tip. this is first time I see such a recipe..shows your patience..nice to see you with wonderful recipes..
waw Mythee, is that ur mom in the pic? those obbatu looks so yummy dear. bookmarking it. Thanks for the recipe and the pictures. I clearly understood how to make obbattu. Many thanks again. 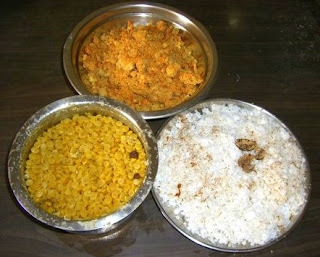 Going to make this for Mangala Gowri vratam. 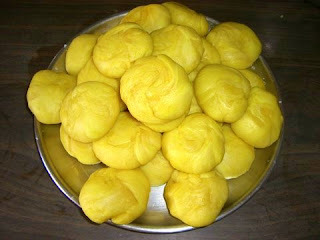 I love obbattu. This is one of my favorite snack item. Your post is so good. Easy to follow. Excellent job. Neeraja & Rumya, thanks a lot! Naanu idanna weekend try maadthiddini. Hope it turns out good. thank you for this recipe. My wife and I we tried making this yesterday (27th Oct 2008). I was a holiday and we didn't have any neighbors give us Obbattu this time over so we decided to make it ourselves! ... Thanks to you're wonderful recipe, we got some really good obbattus out of it! Tip: The cook time or type wasn't mentioned. We recommend to cook the Channa Da about 3/4 and not well done. Thank you so much for trying out my recipe. Thank you so much for the tip, I shall include it in the recipe. I am glad you liked the obbattu. wow !! 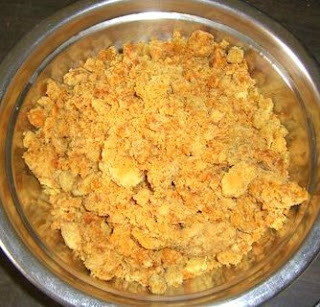 this looks soo yumm :) i was looking for holige recipe to prep today .. for ugadi , am really happy that i found ur blog , simply awesome ! I tried it out and the holige came out very good.. thankx for it!! Holige looks very very yummy. Hello, I tried this Holige recipe yesterday as we all love Holige and cannot find it in Phoenix. The Holiges came out EXCELLENT. Loved the detailed description too. Thank you so much. Now my mom-in-law also thinks Im a good cook. THANKS A TON.